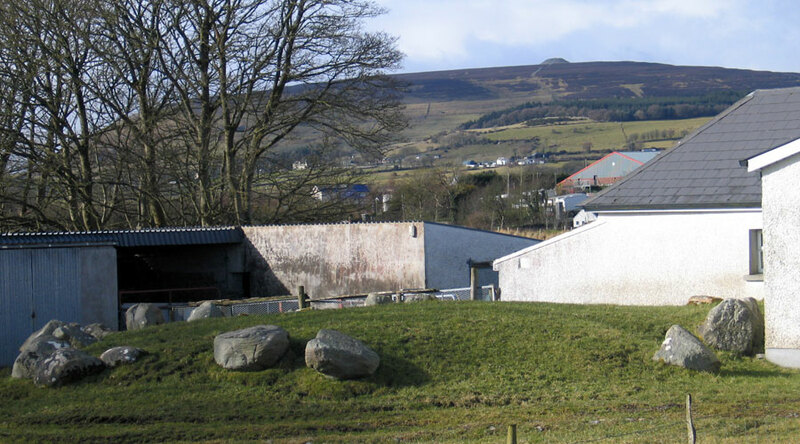 Site 18 is located in a modern farmyard right beside the road. Circle 17 is just on the other side of the cottage. Site 18 has a fairly well preserved circle, but the dolmen has been removed. This circle and Site 17 are somewhat compromised by the cottage, part of a farm, been built around it. The circle actually touches the cottage. We must be thankful that this circle has survived, probably due to local superstitions. Twenty Five of a probable 35 stones remain in the circle, which is 11 meters in diameter. There is a smaller inner circle, 8 stones of which are visible, with a diameter of 6 meters. 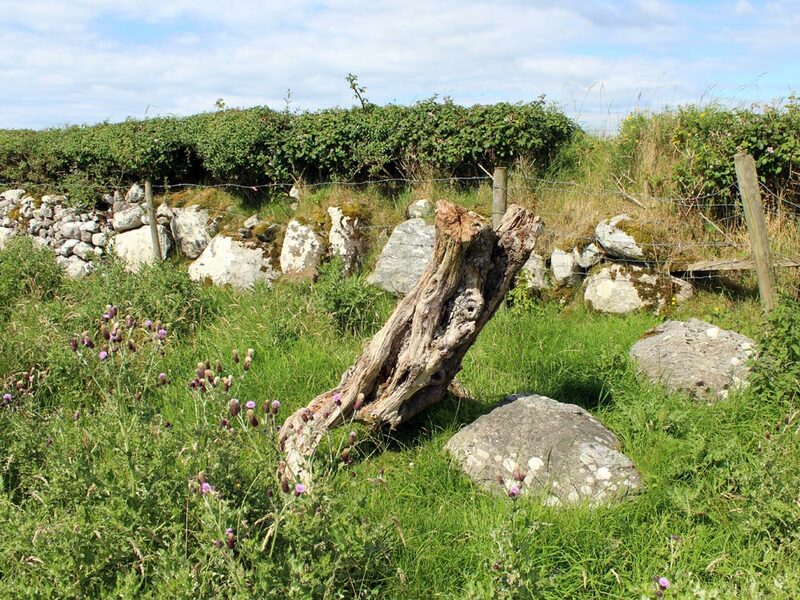 What Wood-Martin and Petrie refer to as a cist in the centre of the circle is the remains of a small roofless dolmen. There is evidence of a passage opening to the east. Finds included a piece of flint, a fossel, and some cremated bone. Details below. Some stones in a fieldwall probably belong to a destroyed circle belonging to Site 19. (1). Situated 20 paces to the south of circle 16. "This circle resembles 14 in every respect. It is 40 feet in diameter has an inner circle, as usual, of smaller stones, and a cromleac, now ruined, in the centre. It appears to have had a second cromleac, or kistvaen, within the circle. Of the external circle twenty-nine stones remain, and the original number appears to have been 35." - Petrie. "The cromleac has totally disappeared since 1837. 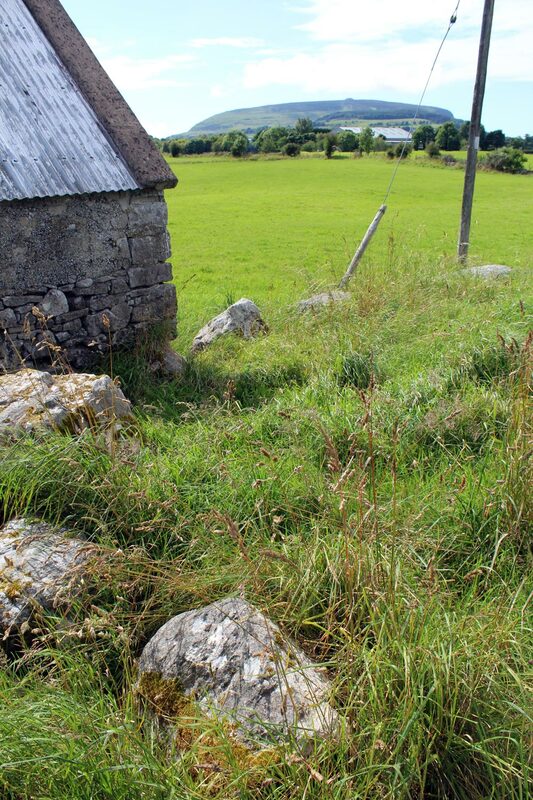 Of the outer circle, twenty-four stones are in situ. Several excavations in various parts of the area were attempted, and at length a small cist (which, from the ground-plan, appears to be a double one, viz. a narrow chamber on the west side, opening into a larger one on the east side) was laid bare." Both portions of it, according to the plan, are not more than 10 feet long taken together. "In it were found seven small fragments of calcined bones, a fossil of the Sligo limestone formation, and a small flint arrow-head." - Wood-Martin. No. 18 (2), (3), (4) Between 15 and 19, "there is every reason to believe that three or more circles have been removed, as the peasantry allege." - Petrie. "The wall for some distance on the south side of the road is formed partly of boulders, such as generally go to the formation of these structures. In close proximity there is an appearance of a ruined cist." - Wood-Martin. Site 18 photographed from the road. 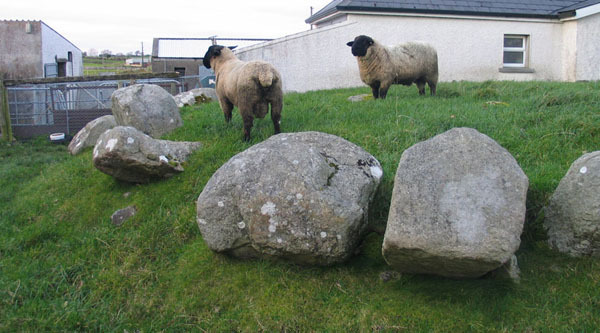 This image shows just how huge a presence Knocknarea and Queen Maeve's Cairn have, looming over the Carrowmore circles.